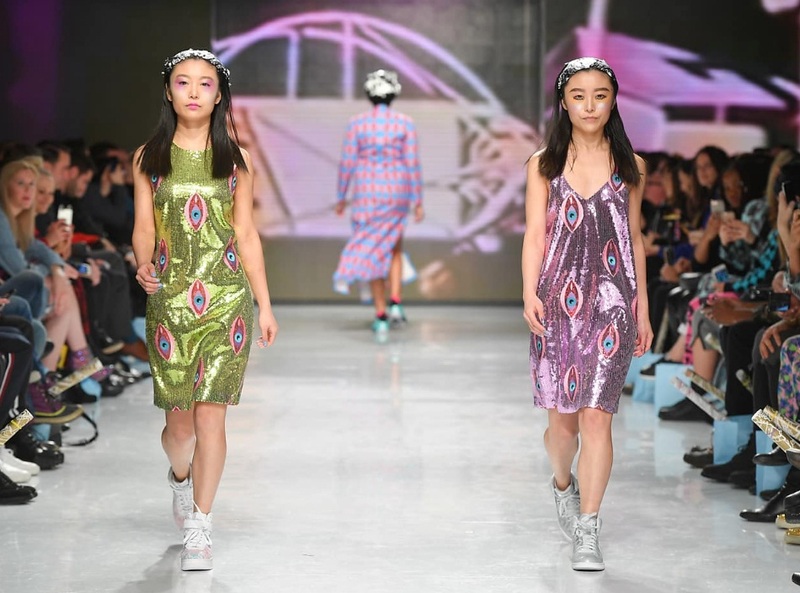 With last night marking the grand finale of Toronto Fashion Week Fall 2018, the past three days at Yorkville Village have been filled with all kinds of daring new collections, created by Canadian designers. For the final evening of the season’s shows, the Toronto runways once again left us impressed. From exotic influences at Mani Jassal to kaleidoscope brights at Hayley Elsaesser, here’s Real Style’s official runway report from Day 3 of Toronto Fashion Week Fall 2018. Emerging Toronto designer Mani Jassal might be a recent graduate from Ryerson University’s School of Fashion, but her eponymous label has already started gathering buzz. Jassal claims to combine her Indian heritage with the craftsmanship of couture, to create a line of eveningwear and bridal looks. 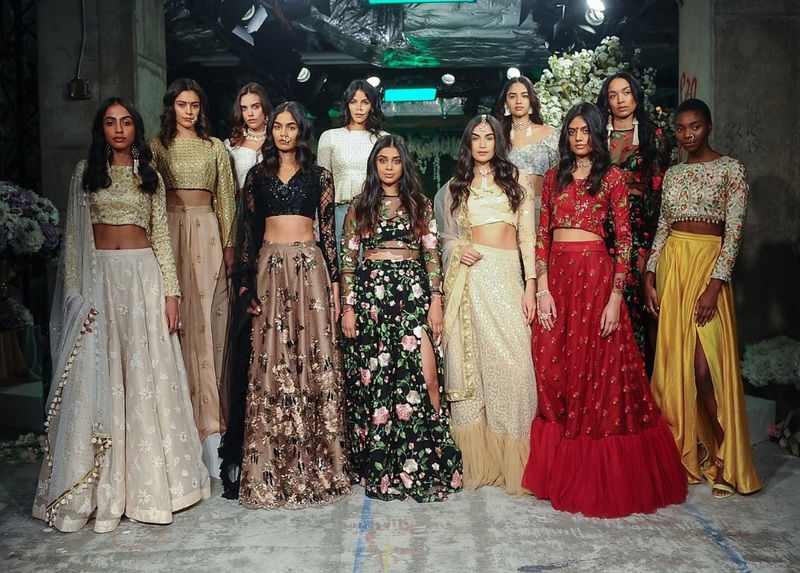 For her Toronto Fashion Week show, Jassal took to the RESET studio to present a range of elaborate, embellished long skirts. Paired with crop tops, the aesthetic was clearly inspired by a traditional Indian sari, but with a contemporary twist. Accented with twinkling gold embellishment and floral embroidery, floor-length hems, bright red fabrics and bared midriffs brought the pieces to life. Toronto talent Andrew Coimbra established his label in 2015, after studying at OCAD University and George Brown College. Coimbra showcased his new Uncuffed collection, which paid tribute to the designer’s artsy, cool aesthetic. Models posed at the studio show, clad in wrap coats and outerwear adorned with yellow snakeskin prints. Traditionally ladylike pieces also made a splash, such as an embellished bodice on a jumpsuit and bold ruffled sleeves on a cropped blouse. Overall, it was the funky zippers, studded leather and checkered patterns on coats which truly drove the collection. Every season, Australian-trained and Toronto-based designer Hayley Elsaesser brings vibrance and joie de vivre to the Toronto runways. At this point, it’s hardly a surprise to see Elsaesser’s crazy, fantastical creations take centre stage. Last night’s Cosmic Dread show featured a lineup of diverse models, all proudly walking the runway with faces painted with pastel rainbow makeup. Yet under the iridescent visages was a level of genuine excitement- a marker of the contemporary runway, where models are free to show their larger than life personalities. The designs were certainly cosmic, with an explosion of little pink dresses, space inspired prints and fitted jumpsuits. Sequins, zippered bombers and belly tops brought together a mix of day and night- although as the label’s fans know, any time of day is a party at Hayley Elsaesser.